A redacted version of special counsel Robert Mueller's report on the Russia investigation is expected to be released Thursday morning, the US Justice Department said Monday. 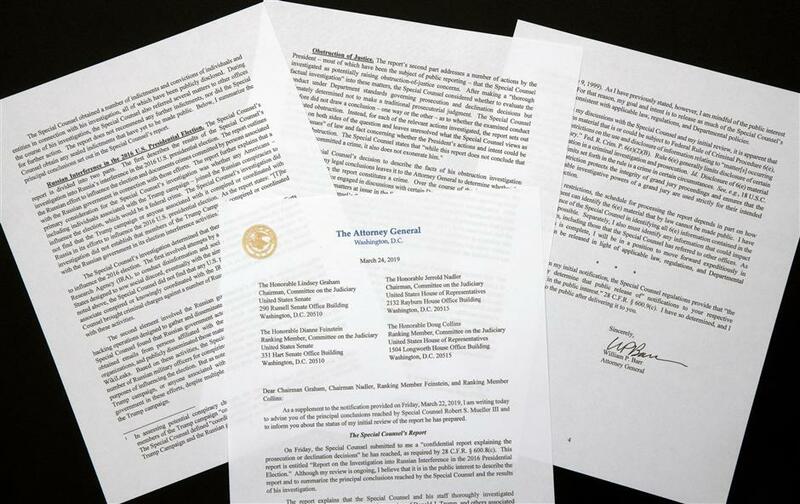 A copy of a letter from Attorney General William Barr advising Congress of the principal conclusions reached by Special Counsel Robert Mueller, is shown Sunday, March 24, 2019, in Washington. Attorney General William Barr intends to release the document to both Congress and the public, according to Justice Department spokeswoman Kerri Kupec. The release would come weeks after Mueller concluded his nearly two-year investigation into the alleged Russian interference in the 2016 US presidential election by submitting a nearly 400 pages long confidential report to Barr. Barr later sent to Congress and made public a four-page summary of the report's "principal conclusions," stating that there was no evidence of collusion between the Trump campaign and the Russian government. The special counsel, meanwhile, did not reach a conclusion on whether Trump had obstructed justice, according to Barr's synopsis. The attorney general concluded Mueller's findings are "not sufficient" to support a charge. Democrats have demanded the full, unredacted report be made public to get a clearer picture of the special counsel's investigation. Barr has promised to be as transparent as possible but told lawmakers that parts of Mueller's report will be redacted to protect grand jury material, sensitive intelligence, matters that could affect ongoing investigations and damage to the privacy rights of third parties. President Donald Trump, who has touted Barr's summary as a "complete exoneration," renewed his attacks against the Mueller-led investigation on Monday. "Since there was no Collusion, why was there an Investigation in the first place!" Trump wrote in a tweet.